Thanks to its professionalism, TROYES AVIATION benefits from all the approvals to maintain planes from Europe and from the United States. The company remains, still now, the only DAHER-SOCATA distributor in France, it also represents the MOONEY manufacturer in several European countries and provides the Service Center for PIPER. References that give TROYES AVIATION an unmissable position in the general aviation market. For more than 40 years, the success of TROYES AVIATION has been based on the unfailing service of its teams and the innovative spirit of Françoise Horiot, accompanied by her son Antoine. Their goal is to maintain a leading position in the General Aviation market by maintaining new aircraft models, staying at the forefront of industry innovations through constant training for their staff, and continuing to run their business in a dynamic, pragmatic, humane and always with the utmost respect of the customer. Discover the different services that our team can do for you. 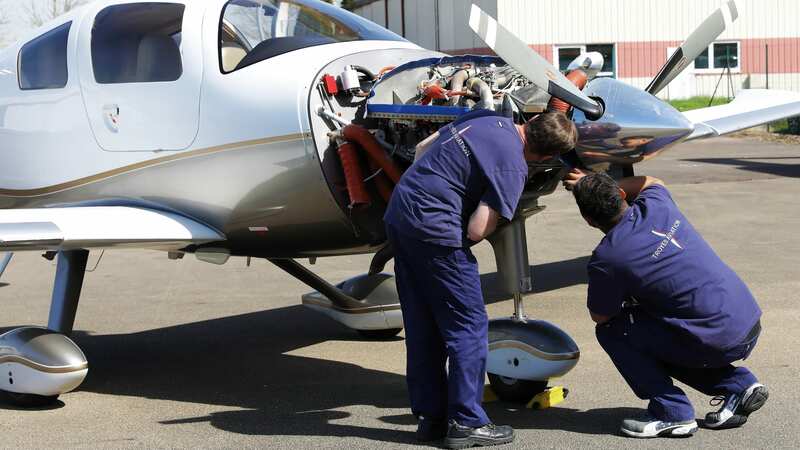 Troyes Aviation can perform maintenance on your aircraft Piper, Mooney and Daher-Socata. Looking for spare parts for your plane? Distributor Daher-Socata, Piper and Mooney, Troyes Aviation sells spare parts at ``price list``. Troyes Aviation has more than 30 years of experience in buying and selling aircraft. You can trust us.